1. Boil potatoes in a cooker with salt for 2-3 whistles. 2. Peel skin off the potatoes and mash them nicely in a large bottomed utencil. 3. Add all the potatoes ingredients to it except ghee and mix properly. 4. Take a tawa and heat it and then add some ghee to it. 5. 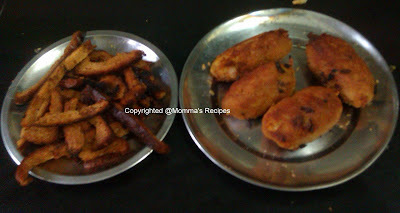 Add the potato to mixture to it and fry by changing sides till its golden brown. 6. Take down the mixture and let it cool for a while. 7. Take breads and remove it corners. 9. Take the bread out and squeeze water out of it. 10. Heat oil in a kadai in the meantime. 11. Take bread in the hand and put some potato mixture in the centre and circle bread around it and press tighly so it holds. 12. Put the roll in the kadai and fry on both sides. 13. Make rest of the rolls in the same way. 14. In the end fry bread corners in the same oil till nicely fried. Bread Rolls and Bread Fries are ready.